My husband caught us napping together last year, and this is the photo. He is my Huggy Honker! 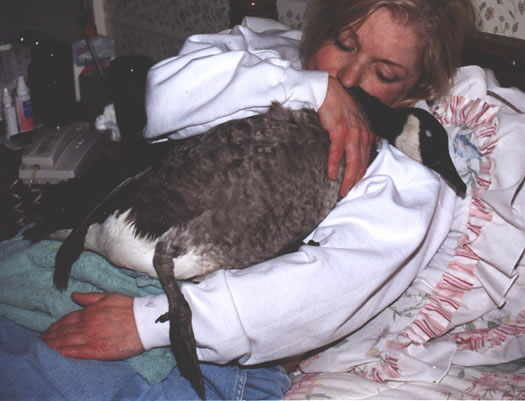 This is Dirty Bird, a Canada goose, that was hauled onto my lawn as a gosling by a dog three years ago. Because of his injuries, he developed a curved spine, inability to fly any distance, and, worst of all, has to be watched carefully if he is in water too deep for his feet to touch the bottom, because has a tendency to capsize. Despite this, I love him more than life itself. For the past three years, we have propped up in bed together and watched TV every evening. Actually, there is no goose poop all over the place, etc. as you would imagine. If he has to go, he stands up, moves to the end of a strategically placed towel, and lets go into a bucket at the bed's edge. He stays in the house in a large dog carrier with the top off (meaning he could come out any time he chooses, but doesn't) and takes showers and baths in the house. We take him outside in the "goose chariot", a large feed tub, to prevent accidents. The way he sticks his head over the side of the bucket as he's being carried down the stairs reminds me of the charioteers in "Ben-Hur". In the spring, my house sounds like an aviary, because I do wildlife rehabilitation. All of that came as a result of associating with Dirty Bird. I was sorting material for a test when my girls came in screaming. Our puppy had invaded a goose nest and brought back a mass of tightly intertwined newly hatched goslings with only two alive. We were a week out with the goslings doing well, when suddenly about 12 AM, I heard DB making a lot of noise. I picked both up, but it was clear that the second one was dying. I can only suppose that there were some crush injuries that eventually caused its demise because there were no external injuries. Holding them seemed to calm both, until one died. I thought (stupidly) that perhaps putting the dead one in with Dirty Bird would calm things down for the night, but DB was pulling on the dead one's beak and literally screaming. DB was wild and did not take to human condolences. He cried throughout the night. All I could do was to remove the dead bird and hold DB for a while. However, as it grew later, I became afraid that I might crush him if I fell asleep, so I had to offer my hand in the cage. Throughout the night, I laid on my back with my right palm up and when the circulation stopped, rolled over on my stomach with my other arm in the cage with my palm up. As the morning dawned, he stepped into the palm of my hand, sat down, and seemed to go to sleep. I very slowly closed my hand around him, and the bond was forged between us forever. When people think of Canada geese (Canadian goose means that it was born there), they think of a brainless bird that puts food in one end and poops it out the other. I have raised three other goslings since DB and successfully released them into the wild. These birds are intelligent and don't walk up to just anyone. They know who they can trust and who is suspect even from a tiny gosling. My daughter and I were walking DB one morning at a pet friendly hotel when this frail fellow comes busting through a door with two dogs bigger than he was,and they were barking ferociously. DB held his ground between us and just hissed. Had he run, I'm certain the man would have lost control of the dogs and anything could have happened. These birds have smarts. The goslings eat and poop copiously, but in less than a year they require very little and produce a lot less excrement. They are very loving and loyal. It truly upsets me that people are "managing the Canada goose population" by rounding them up and sending these birds to meat packing plants. Unlike people, they mate for life. To me, it is a reenactment of the Jewish experience under Hitler.